Since I seem to be on a roll highlighting authors, why not keep going with one I meant to mention when the book first arrived in my mailbox? Nancy A. Hewitt's Radical Friend: Amy Kirby Post and Her Activist Worlds. Hewitt wrote an fantastic study of Rochester's reforming women, Women's Activism and Social Change: Rochester, New York, 1822-1872, that was one of those earlier important studies of women's political behavior and of the ways that the antislavery movement functioned and fit among other social movements. One of the figures at the center of several networks in that study was Amy Kirby Post. Amy Kirby Post was also a key figure in Douglass's career, being instrumental in his move to Rochester to establish his paper. Post and her husband Isaac (but most she) always found the vanguard of any organization. They were not just Friends, but Hicksite Friends, and then left the Hicksites because the Hicksites were not bold enough in denouncing slavery. Then they became some of the first Spiritualist. (Douglass thought this was nonsense and had to apologize to them when he was a bit rude during a séance.) They went to the Seneca Falls Women's Rights Convention and signed the Declarations of Sentiment. 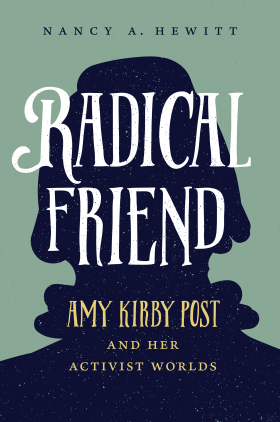 Amy Post not only helped Douglass, but also helped Harriet Jacobs's Incidents in the Life of a Slave Girl find a publisher, and she helped people fleeing the enforcement of the Fugitive Slave Law. She remained a Garrisonian as Douglass became more political, and they had a parting of the ways, but she was always -- I thought -- one of the most decent figures in all of the intra-abolitionist squabbles. For the longest time, the only biography of Post was an article written by Hewitt for the University of Rochester Library Bulletin. So, much was the joy when the University of North Carolina Press published her book-length biography of Post this year. Hewitt has teased out an extensive web of family and religious ties that extend from Long Island to Western New York and beyond. Post's alienation from Douglass in the late 1850s meant that she had more contact with the figures who dropped out of his story, which, taken with Post's other reform activities, means that Hewitt describes a whole sets of women who either ended up on the cutting room floor or didn't come near my book, as much as I would have liked them to. Harriet Jacobs and Lucy Colman being two. So, reading Radical Friend is reading an expanded universe of Douglass, but it is also the story of an honestly good woman with incredible inner steel. The Isaac and Amy Kirby Post Family Papers live at the University of Rochester, which also has a digitized project, a godsend to researchers who cannot visit.